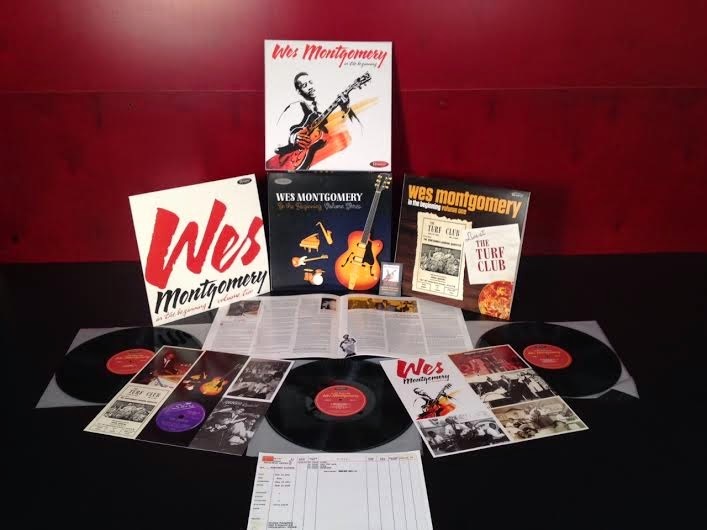 For any Wes Montgomery (or Montgomery brothers) enthusiast it is hard to muster enough superlatives to do justice to this package. It consists of a handsome boxed set of three heavy weight (180 gram), high quality (mastered by Bernie Grundman, pressed by RTI) vinyl LPs. 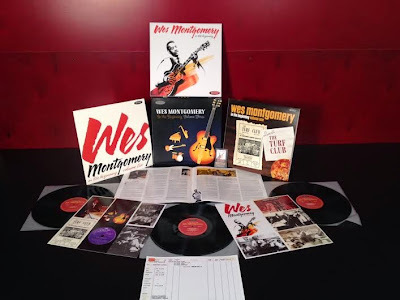 The records are housed in strikingly designed individual sleeves and accompanied by a kind of Christmas-morning of extras: a jumbo eight page LP-sized colour booklet, a souvenir reproduction of an original Montgomery brothers’ session recording contract (union scale in 1955 was $51.50 all-in for the Montgomery brothers performing four tracks), and two large sheets of colour prints — rare original photographs of the musicians in action, reproductions of record labels, record cover illustrations, and a facsimile club handbill (“Go-Go Session every Saturday… Mixed Drinks… Plenty of Parking”) — all on perforated heavy duty sheets so you can use them as postcards, if you’re sufficiently philistine to rip them apart (listeners of a certain era will have fond, tearful memories of a similar giveaway with the Rolling Stones’ Exile on Main Street). But enthusiastic treasure-trove analogies should be lavished not on the packaging, but the provenance of the music on offer. The booklet describes how in 2011 pianist Buddy Montgomery’s widow Ann revealed a cache of live recordings of the Montgomery brothers playing in clubs in Indianapolis in the mid Fifties (including at the wonderfully named Missile Lounge). These 17 tracks, sourced from the original reel to reel tapes, comprise the entire first two LPs in the set, as well as a single cut, Night in Tunisia at the beginning of the third. Indeed, there was a point where these club recordings would have represented the entire set. But a serendipitous meeting with drummer Kenny Washington led to a forgotten (and unreleased) session by Wes Montgomery for Columbia Records. The Columbia recordings were made at the legendary 30th Street Studios (birthplace of Kind of Blue) on 15 June 1955 and were produced by none other than Quincy Jones in one of his earliest production roles. However, even this wonderful discovery didn’t put an end to things. By now Resonance Records had the bit between their teeth and they proceeded to unearth more gems: a rare 12 minute tape of All the Things You Are showcasing Wes and Alonzo ‘Pookie’ Johnson at a Chicago club in 1957, and an even rarer pair of 78rpm discs issued by the obscure California label, Spire Records, in 1949. These four tracks feature Gene Morris and His Hamptones with Wes as a sideman. How rare are they? Well, as the notes disclose, even the Library of Congress didn’t have copies. One of the 78 sides has been reissued elsewhere, so only the remaining three rarities were added to In the Beginning, to make a total of 26 tracks. The club recordings rendered on vinyl have a clean, sweet, direct live sound. Fascinating Rhythm showcases a tight and well integrated combo, with Pookie Johnson’s sax standing out from the deck like a magician’s force-card and Wes’s chiming guitar adding highlights. Although we refer to the band as the Montgomery Brothers, at the time these tapes were made they were calling themselves the Montgomery-Johnson Quintet and consisted of Wes, of course, on Gibson L5-CES guitar and his brother Monk Montgomery (born William Howard) on Fender Precision electric bass and Buddy (born Charles) on piano, and occasionally vibes, with Pookie Johnson playing alto sax and Sonny Johnson (no relation) on drums. A breakneck Brazil has Wes’s guitar overwhelmed by frantic Latin percussion due to a less than ideal microphone position — a trifle frustrating, but the audience certainly sounds like they’re enjoying it, with delirious whoops on and off the bandstand adding to the ambience. And even in the background, Montgomery’s towering virtuosity asserts itself, producing a shimmering fan of chords that gradually assumes an almost vocal quality. It gives way to an epic version of What is There to Say on which Pookie excels himself, playing soft, sensual and poised alto which is beautifully supported by some elegantly plaintive strumming from Wes, who then takes a slow, studied solo. Buddy Montgomery chimes in with a deliberately placed piano solo closely shadowed by Pookie’s sax, enunciating each syllable of the song’s lyric. Wes’s gift for comping is on display again in How High the Moon which starts with concise, scorching licks from Pookie, then features Wes flowing into a sensual, nimble solo. Unison guitar and electric bass, from Monk Montgomery, ride on Sonny Johnson’s drumbeats before yielding to solid slabs of tenor sax from Pookie. These are really excellent recording, though their “field” nature mean there’s an occasional issue with mic position or instrumental balance. I Should Care is a duet by Wes and singer Debbie Andrews (“Formerly with Duke Ellington” boasts the showbill) and here Wes’s strumming providing a lazy trampoline (and safety net) for the slow ballad vocal. Buddy Montgomery plays slightly spooky, skeletal vibes with considerable skill, while Jack Coker sits in on piano, on Ralph’s New Blues which also features Wes playing a Fender electric bass and getting a fat sound from it. Wes’s easy loping approach to Benny Goodman’s Soft Winds is typical of the club sets. The tune has a bouncing, funky infectious groove reminiscent of Cy Coleman’s I’ve Got Your Number. It’s a long workout with some plangent improvisation from Wes, supported by brother Monk’s chitlin-circuit bass as he plays sinuous, complex and athletic guitar. Buddy offers restrained commentary on piano. The piece is an extended odyssey (over eleven minutes). Robbin’s Nest features a cheeky quote by Wes from Santa Claus is Coming to Town while the guitarist is to be found scrambling hectically all over the jagged bebop surface of Night In Tunisia (the chugging, chunking drummer here is Paul Parker). This is an amazing set. On an archival level it would be indispensable, but forget that — it provides hours of casual (and not so casual) pure listening pleasure. As mentioned, some of the tracks are limited by the guerrilla circumstances of their live recordings, and the intervening years (the tape of All the Things You Are is somewhat war-torn). And I could occasionally have done with less abrupt run-ins on the vinyl. But none of this weighs against a stunning collection of music, marvellously presented. The tracks are also available on a double CD set (HCD-2014) — but it’s hard to imagine why anyone with a functioning turntable would go for that option when this absolutely gorgeous package is available.